I left the Congo Kinshasa in 2001 because my country was at war and my family had disappeared. My trip lasted five years. I traveled through the Congo, Benin, Burkina Faso, Mali and Senegal by canoe, by car and on foot, until I reached Morocco. In Morocco, they suggested me to come to the Foundation, where I got the opportunity to further my knowledge of embroidery: now I work at the Atelier “Migrants du Monde”. The sewing space gives me a sense of stability. Solange comes from the Democratic Republic of Congo: in 2000 she is forced to leave the country due to war, and she embarks into a journey to try and find some security. Solange is forced on a five years trip through several African countries: she sleeps and eats in the street, she walks and walks and walks… alone or with bunches of migrants that, like her, have left everything behind: their land, their homes, their beloved ones. During her journey, Solange is victim of numerous violences; at the Algerian frontier, Solange becomes pregnant. When she arrives in Oujda, Morocco, Solange is suggested to reach Rabat, where she would find better support. Here, Solange finds the Fondation Orient-Occident: the kindergarten of the Foundation offers her a safe place to raise her daughter, meanwhile she is able to follow language and professional training courses. 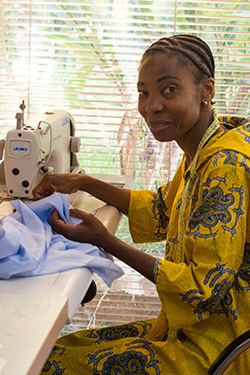 Solange has, ever since 2005, joined the Atelier “Migrants du Monde”, where she is still working nowadays, enriching it with her knowledge of the local embroidery of her country of origin. Solange’s daughter was brought to Europe by another Congolese woman, who used her as a “safe-conduct” to pass through the borders. She is now in Paris: Solange waits to see her again one day.